Innkeeper. - An innkeeper's house is a public place to which travelers may resort. He cannot therefore prohibit persons who come under that character in a proper manner and at suitable times from entering, so long as he can accommodate them. He is not obliged to receive one who cannot pay for his entertainment. Indeed, he must exclude some persons who apply, notably thieves. He can refuse to admit all whom he has reason to believe will disturb the peace and safety of his guests; and can afterward exclude all who, though admitted, prove to be noisy and disturbers of the comfort and safety of others. And if having a stable he is under the same obligation to receive and care for horses as he is to receive the person to whom they belong. Again, he is not required to provide a guest with the precise room he may select, but only reasonable and proper accommodations. If he refuses to do so he is liable in law to the applicant. In caring for the baggage of a guest, the law is not as well settled as it might be. A competent writer has said: "They are insurers of the property of their guests committed to their care, and are liable for its loss, unless caused by the act of God, a public enemy, or the neglect or fault of the owner or his servants." This strictness of liability, it is said is necessary to protect travelers against any collusion between the innkeeper and his servants, and to compel him to take care that no improper persons are admitted into his house. His charge for the entertainment of his guests is sufficient to cover this risk; he also has a lien on their property entrusted to his care to indemnify him against loss. By statute in many states innkeepers are exempt from loss by fires which are in no way caused by their own negligence or that of their servants. If a horse dies while in the innkeeper's charge, he is liable unless he can show facts that excuse him. 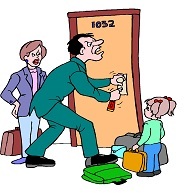 If the goods of a guest are stolen by the innkeeper's servants or domestics, by another guest, or by someone outside the inn, the innkeeper must make restitution, for it is his duty to provide honest servants, and to exercise an exact vigilance over all persons coming into his house as guests or otherwise. His responsibility extends to all his servants and domestics, and he is bound in every event to pay for them if stolen, unless they were stolen by a servant or companion of the guest. Illness or absence of the innkeeper does not excuse him. An innkeeper is not liable for the loss of a guest's property when this loss is due to the fault or negligence of the guest himself. Thus an unnecessary display of money or valuables, or leaving them where they would tempt thieves, may be negligence. But failure to lock or bolt his door is not necessarily negligence on the part of a guest. It is only evidence of negligence. Nor is an innkeeper exonerated when a theft is committed by a fellow guest with whom the owner of the property stolen had consented to occupy the same room. An innkeeper may make needful and reasonable regulations that are to be observed by his guests to secure the safety of his property. When they are made and brought to the knowledge of a guest he is bound by them. By contract, custom and statute the responsibility of an innkeeper may be changed. In many states by statute an innkeeper avoids liability for the valuables of his guest unless they are deposited with him. These statutes are construed strictly in favor of the guest. Nor can an innkeeper even by these exempt himself from everything, for if a guest were required to deposit all he had to secure such protection, he would be in a strange fix. Said a Georgia court: "Is the guest to deposit his valise there, and go and send for it to get out a clean shirt?" If a guest goes away, leaving his valise or other things with an innkeeper, he is not required after a reasonable time to observe such diligence in keeping them as he receives nothing in the way of compensation for so doing. Keepers of lodging and boarding houses are not innkeepers, nor subject to their liabilities. The proprietor of such a house does not hold himself out to the world as prepared to supply accommodations for all who may apply, nor is he required to receive any persons unless he chooses to do so; an innkeeper's freedom is restricted in this respect. A house may have a double character of boarding house and inn. With transient persons who, without a definite contract, remain from day to day it is an inn; with those under definite contract it is a boarding house.